*Choco Choco- A delicious double dose of semi-sweet and rich dark chocolate with premium peanut butter and wild honey — it's decadence and delight in every bite. *CoCo Bananas- A tropical blend of yummy bananas, cocoa and wild honey, this peanut butter adds a taste of island paradise to any kitchen. 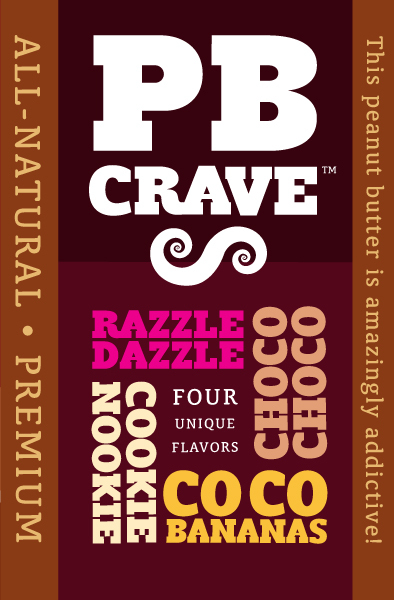 *Razzle Dazzle- A twisted blend of red raspberry, wild honey, cool white chocolate and rich dreamy darkness — this peanut butter offers a magical mix of deliciousness. *Cookie Nookie- A mouth-watering mix of chocolate chips, cookie dough flavor, wild honey and premium peanut butter — it’s two classics together as one. Don't they sound delicious? They taste even better! 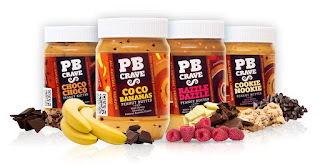 Within the first 15 minutes of the PB Crave flavors arriving in my home, I had tasted them all. I told you, I can't resist! 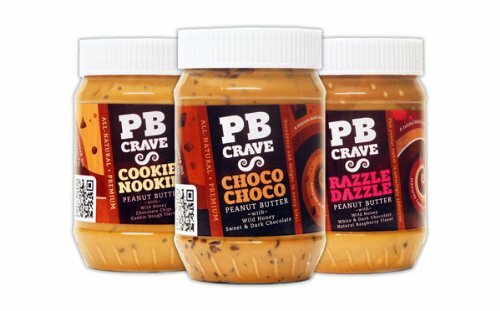 They all taste delicious by themselves, but my brain instantly started thinking of amazing things to do with these peanut butters. I can dip fruit in them, make the best pb and j ever...without the jelly, put it in my oatmeal, on my waffles, on my ice cream, etc. As I suspected, CoCo Bananas made the BEST ELVIS ever! Actually you could probably skip the bananas since the banana flavor is so prominent in CoCo Bananas. This flavor is delicious and I will definitely be eating more CoCo Bananas Elvis sandwiches. These were incredible! They taste like a mixture of peanut butter cookies and chocolate chip cookies. They were so good. I can't wait to try Cookie Nookie with a better peanut butter recipe. I haven't had a chance yet to try the Razzle Dazzle or Choco Choco in any recipes. I have been eating them with fruit though. The Razzle Dazzle has an amazing Raspberry flavor. It is so delicious. I am hoping to use it in a fudge recipe soon. Choco Choco has a chocolate flavor to it and would be insane in any peanut butter/ chocolate recipe (buckeyes or peanut butter cups would be great). All four flavors are great with fruit or in oatmeal. You can use them anywhere you would use regular peanut butter and more. I honestly can not choose my favorite flavor. They are all so delicious. Just when you think they couldn't get any better, they do. For every jar of peanut butter that is sold at least 2% of the profits go to Project Peanut Butter, a non-profit organization focused on treating malnourished children. I love companies that give back! 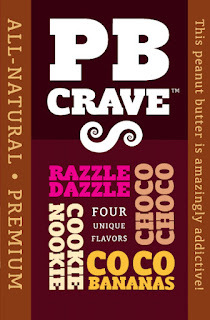 Visit PB Crave today to pick up some amazing flavored peanut butter. The CoCo Banana said wonderful to me. The Cookie Nookie looks so good!